I once came across the thought–I don’t know whose it was or where I read it–that it doesn’t matter which spiritual path you choose, because they all lead to the same place. It only matters that you pick a single path and stay with that one to the end. I don’t know that I agree with that. No less a religious scholar than Huston Smith says he practices something from each of them–Christianity, Islam, Hinduism, Native American spirituality, Buddhism, etc. But I do see the advantage of sticking with one path in some things, and yoga is one of them. My introduction to modern postural yoga–as contemporary Western yoga is known–started about 15 years ago with something called Power Yoga. What a great workout, I thought. But I wanted to try other schools, and by great good fortune there were Iyengar classes taught at my health club. I knew a little about Iyengar and his writings, and I wanted to see what his style was like in practice, just for the sake of comparison. Looking in on a class, the students were sitting cross-legged on blanket. That didn’t seem too hard. It took just one Iyengar class for me to realize that it was a miracle I hadn’t hurt myself in power yoga with its emphasis on vinyasa: flowing, or rather powering from one pose to another, with little instruction on proper alignment. In the Iyengar classes, the instructor was well informed about anatomy and physiology, and gave every student significant guidance. Flexibility and striking artistic poses was not emphasized; focusing intelligence and awareness on the workings of one’s own body was. And it was a lot harder than it looked. I never looked back. I have been a practitioner of Iyengar-style yoga for over twelve years, still with my instructor Liz from those first classes. Light on Yoga. Plenty of guidance on how to perform the asanas of modern postural yoga, lots of pictures, and a concise background on yoga philosophy. It would be a mistake to think that the poses go all the way back into antiquity (see Mark Singleton’s book Yoga Body: The Origin of Modern Posture Practice for a discussion and James Mallinson’s critique for an interesting response). However, Iyengar uses the myths to ascribe meaning to some poses. The classic example would be Natarajasana, pictured on the cover of Light on Yoga, and a famously difficult pose. It honors Shiva, who in ancient texts is Lord of Yoga and also the Lord of the Dance. When Shiva begins the Tandava, the Dance of Destruction, the world will end. The Tree of Yoga. A good bedside book. Iyengar creates a wonderful analogy between the eight limbs or eight parts of modern yoga and the parts of a tree. The yamas, or ethics that govern human relations, provide strong roots for the yogi. The niyamas, or rules of self-conduct act as the trunk, conducting energy to the branches, or asanas; the poses, or asanas; pranayama, or the breath. The leaves on those branches, by which the tree takes in nourishment, are the breath, prana, and pranayama is how the breath is used. The bark protects the internal tree; Iyengar likens it to pratyahara, or the withdrawal of the senses that is necessary to find inner stillness. The sap is dharana, inner stillness and concentration, which focuses everything to achieve the flowering of full consciousness, or dhyana. The final limb, samadhi, is the fruit of all this effort, when body and senses are still but the mind is fully alert and conscious. Light on the Yoga Sutras of Patanjali . The Yoga Sutras, in contrast to modern postural yoga, have roots that go at least as far as the first centuries CE, perhaps even earlier. 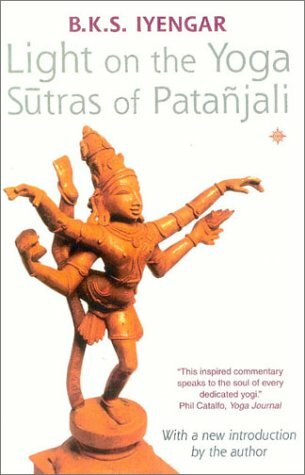 The author, Patanjali, may have lived as long ago as 500 BCE, but this is a matter for scholarly debate. There are 196 sutras, teachings about how to practice yoga, collected in four parts that describe four spiritual paths–devotion or bhakti marga, action or karma marga, knowledge or jnana marga, and renunciation or vairagya marga. Each sutra is short, and I do mean short. For example, the whole first sutra, “atha yoganusasanam,” means something like, “and now, how to practice yoga.” The second, “”yogah cittahvrttih nirodh,” translates as “yoga is stilling the mind’s movements.” For centuries, scholars and practitioners have interpreted Patanjali’s brief aphorisms, of which Iyengar’s translation is just one. He devotes pages of commentary to elucidate each sentence. I won’t claim to understand even a tenth of it. Kadetsky, Elizabeth. First There is a Mountain. Kadetsky is a journalist and was Fulbright fellow in India, when she lived and studied at Iyengar’s ashram in Pune. 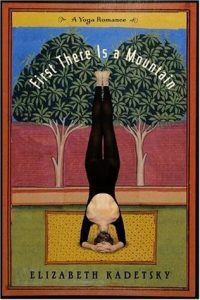 Her memoir about that time lovingly but firmly takes Iyengar off the pedestal on which many Westerners have placed him. She weaves her own spiritual search with her research about Iyengar, which included interviews as well as unrestricted access to his archives. She shows the contradictions in the way he treated his Indian and Western students and discusses the conflict between Western appropriation of yoga and yoga’s place in Indian life. A good place to learn something about the origins of modern postural yoga and its tenuous links to the mythical, mystical past.